I don't know much about this image. A friend sent it to me a while back, and it's been sitting on my hard drive. It shows Malden looking south from Leland. I lived at 4629 N. Malden from summer of 1955 until my mom and my brother and two sisters moved closer to Senn high school (on Wayne st.) in 1963. 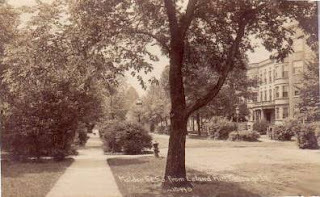 This photo looks like it is taken from just off the corner of Leland Ave. looking South towards Wilson Ave. My apartment building would have been on the left about a half block down. The last name of the owners of my apartment bldg. was Pedigo. I used to get paid five dollars a week to hand scrub (on my knees) the front entry to the building and all the halls and stairs to the third floor! I also used to go to the stores for Mrs. Pedigo and she would pay me something like a quarter. I live at 4631 N. Malden, which is currently the other half of 4629 N. Malden. Do you have any images of the building from the period when you lived there? I'd love to see them. It looks like parking was not a problem. I live on the 4700 block of Malden now...it has more trees...and cars.